Kin spent most of the night itching under the sensation that Something Was Wrong. The little knife girl slept soundly, cuddled up next to her dam and littermate. (Kin knew their names — names were an important human thing — but the girl felt like a knife, sharp and bloody.) The boy-pup snuffled in his sleep, rolling around and thumping Kin in the ribs with his pointy elbows. The dam slept light. Every now and then Kin saw her eyes gleaming in the dim light, wary crescents beneath half-lowered lashes. Kin held her post until early morning, when movement finally gave her an excuse to slink out of the tent. The other pack — team, her training supplied — were leaving. It was a quiet process, lots of stretching and making the burned-dirt morning drink humans liked. The captain-female slapped on Namiashi-captain and Shiranui-lieutenant’s tent, and ducked in before they answered. The pale-faced, dark-haired human peeled away to hover in front of Kakashi’s tent. When he didn’t go in, but also didn’t leave, Kin trotted over and headbutted him pointedly in the hip. The awkward human glanced down at her, surprised and sleepy, in the sour-smelling way younger males sometimes got. He dropped an absent hand on her head, scratching her ears with blunt fingernails. That hadn’t been her goal, but humans had very good fingernails for scratching, so Kin tilted her head and allowed it for a moment. The human dropped his hand, looked at the tent flap a moment more, then turned and went back to his team. Kin watched him go, puzzled. The captain-female had returned as well. She gave a few short orders, and then all five of them melted away into the dawn. Namiashi and Shiranui hadn’t left their tent yet, but rustling sounds suggested they were working up to it. Kin guessed it wouldn’t be long before Team Six headed out, too. She delicately pulled the zipper down with her teeth, and shouldered her way into Kakashi’s tent. The primary scent inside was more sour young male. Kin wrinkled her nose, eyes adjusting to the darker light. Two lumpy shapes were tangled in scratchy blankets and each other. Her tail swished, pleased. Kakashi was terrible at sleeping near people, but she could see his face tucked down against the back of Tousaki’s neck. He had one arm wrapped loosely around Tousaki’s chest, because humans were sprawling creatures and didn’t know how to curl up neatly with each other. Their legs were all hooked together. Tousaki’s face was sort of scrunched. Kin padded closer, sniffing. It wasn’t just young-male scent. It was stress. From both of them. In their sleep? Her ears twitched back and forth uncertainly. Human faces were hard to read. She didn’t like not knowing. She planted both front paws on Tousaki’s chest and swiped her tongue over his cheek — salt, sweat, bitter-bitter-bitter. He needed to wash. She could help with that. He spluttered awake under her ministrations, rolling back against Kakashi. That made it easier to get to his whole face. She yipped and laved his chin. He didn’t sound sad, but something still didn’t feel right. She crowded up on top of his chest, forcing him to lie flat (Kakashi rolled hastily out of the way), and settled her whole weight on his body. He felt skinny under her — humans had such narrow ribcages — but solid. She hooked her paws over his shoulders and nudged urgently at his chin, demanding an explanation. What was wrong with rot? Kin butted her head against his chin, making his teeth clack together, and whined. A moment later, cool fingers curled over the bridge of her muzzle, forcing her to pull her head back. “He’s fine,” Kakashi said, with a rumble under the words that soothed like water down Kin’s spine. She rolled a worried eye at him; Kakashi gave her a look that made her paws too big and her learning too small. Her ears tucked back. Something had just happened that Pakkun would find hilarious, Kin guessed. She sat up a little more, tail sweeping with vigor now, and licked Ryouma from his chin to his forehead, because he still smelled like he needed it. He rumpled her ears again. A hand slapped the tent’s waxed canvas side, making all three of them twitch. “Get ready, we’re leaving in ten,” Namiashi-captain said. “Yessir,” Tousaki said sharply, scrambling upright as soon as Kin slid off him. In the flurry of activity that followed, Kin slipped back out of the tent, still unsettled, and kept out of the way. Tousaki did a strange thing before they left. The little knife girl and her family were all loaded up in the bigger cart, sharing a cold breakfast and warm drinks. Yuuhi helped them, but her attention was like a butterfly on a string, landing everywhere, missing nothing. She saw when Tousaki pulled Namiashi-captain and Shiranui-lieutenant aside, eyes sharp and curious, but didn’t follow. Kakashi did, and Kin trotted on his heels. They didn’t go far, just a little ways downslope, to a clearing between trees. As soon as Tousaki stopped, he turned and bent at the waist. A low, deep bow that Kin had learned, for humans, was not an invitation to play. Tousaki was showing his belly. She lurked uncertainly behind Kakashi’s legs, distressed. From her current position, Kin could only see Namiashi-captain and Shiranui-lieutenant’s profiles, which made it harder to read their faces. But she saw Shiranui-lieutenant’s eyebrow flick up, and Namiashi-captain’s mouth part. She definitely felt Kakashi stiffen. “And now?” Namiashi-captain said, at last. Was this about killing little knife girl’s sire? Saishou hadn’t liked it, but Kakashi had explained, and Kin trusted Kakashi. And little knife girl had slept afterwards, deep and sound. “Thank you, Tousaki,” Shiranui-lieutenant said, and took a step forward to lightly touch Tousaki’s elbow. Tucked behind his back, both of Kakashi’s hands clenched. His scent, normally clean and subtle, had gone bitter-rank. Kin eyed him nervously. Was something wrong with his ears? Maybe he needed them cleaned. “We’ll work on that,” Namiashi-captain said. They were planning to make mistakes? Sometimes, Kin really did not understand humans. She pressed against the back of his legs, clinging and upset. Why was he wrong? He smelled like distress. She didn’t understand what was happening, but Namiashi-captain and Shiranui-lieutenant didn’t look appeased. Even Kin wasn’t entirely sure she believed that. “Captain,” Kakashi said tonelessly. He strode away. Kin scrambled after him, turning once to give Namiashi-captain a look of deep disappointment. Halfway back up the hill, her sharp ears caught a muttered: for the love of gods. Getting off the mountain took the rest of the day. Kin rode in the family cart with her little knife girl, enjoying ear scratches and the occasional nap. Tousaki and Shiranui-lieutenant came and went at intervals, occasionally course-correcting the downhill route. The midday sun was warm enough to dry the mud on the ground. The afternoon was hot and lazy. By evening, the terrain was levelling out. They made camp. Kakashi and Kin hunted, flushing out wild rabbits and a pair of fat, unwary brush-birds. Tousaki skinned, butchered, and cooked, and let Kin have the unused bones. Kakashi worried Kin by dozing off next to the fire before the sun had even finished going down. His skin was hot and tight where it wasn’t muddy, and he sat up with a yelp when Kin licked his face. She didn’t believe his vague reassurance about sunburn — burns were bad — but Tousaki seemed more amused than concerned, and Kakashi didn’t keel over at any point, so she resigned herself to keeping a close eye on him. Everyone else’s skin was just warm and brown after a day in the sun, except for Shiranui-lieutenant, who smelled like zinc. The next day, Kakashi was still on cart duty, but he smelled like zinc too. On the fourth day, they reached Niseko, which was a big enough human place to have an iron road for the giant, roaring, steam-spewing monster Namiashi-captain called a train. It was like a terrible articulated centipede made of metal, except it went so much faster, and it screamed. The carts were loaded into one of its hollow segments, lashed down with ropes and nets. The little knife girl and her littermate tumbled in with excited shouts, running around to poke everything. The adults followed, wearing glamors that made them look like regular civilians, with no sign of terror at being eaten. Kin trembled her way aboard, belly low to the ground. “Do you want to go back?” Kakashi asked her, soft-voiced. The pull to go home was getting stronger by the day, but it wasn’t painful yet. And Kin wouldn’t be satisfied until she knew Kakashi’s strange, makeshift pack had reached Konoha safely. She snorted at him, straightening reluctant limbs. Kakashi sunk a hand into her scruff, giving it a brief shake. Still, the second Tousaki sat down, making noises about teaching the pups how to play something called Daifugou, Kin was insinuating herself into his lap. He made room for her, shuffling a pack of cards over her back. When the train-monster began to move, lurching and shrieking, Kin cringed. Tousaki rubbed a broad hand between her ears, palm cupping her skull. She curled up, panting heavily, and waited for death. Tousaki didn’t complain when she drooled on his knee. He grumbled a little when his legs went numb, but didn’t make her move. Little knife girl won the first three hands, then the boy-pup showed unexpected talent and destroyed them all. It was too exhausting to stay terrified, especially with a rock of calm surrounding her. Eventually, lulled by the steady rumble and Tousaki’s mellow scent, Kin drowsed. When she woke, it was night again. Little knife girl and her brother were cuddled up with their dam, wrapped in blankets and asleep. Shiranui-lieutenant was perched on the sake cart, doing that thing where he sat quiet and still, palms resting lightly on his knees, eyes closed, chakra humming in waves. Kakashi called it meditating. Namiashi-captain was sleeping next to the sake cart, head resting on a pack, one arm over his eyes. Kin lifted her head carefully. Tousaki was slumped back against the wall behind her, dead to the world, mouth slightly open. His arm was resting heavily on her shoulders. Kakashi was sitting next to him, kiltered sideways to lean against Tousaki’s shoulder. His eye was closed. His scent was peaceful. Kin’s tail thumped gently against Tousaki’s thigh, not enough to wake him. She yawned, torn between untangling herself or going back to sleep, and caught sight of Yuuhi. The woman was sitting nearby, watching Kakashi and Tousaki with bright, curious eyes. Snake-minded, the Old Ones had called her. Kin’s ears flicked back, then forward, uncertainly. Kakashi shifted in his sleep, leaning more heavily against Tousaki’s side. Tousaki didn’t budge. Kin raised her muzzle and licked the underside of Tousaki’s chin, once, very lightly. He frowned in his sleep and mumbled something. Kin looked at Yuuhi and waved her tail. Very carefully, Kin eased herself upright, stepping out of Tousaki’s lap without jolting or squashing him. She padded over to Yuuhi and sat at her feet, tail curling neatly around her own paws. Pakkun had explained a little about Yuuhi — that she had known Kakashi when they were both pups, and something complicated and human had made them bare teeth at each other. Kin placed a paw on Yuuhi’s knee and tipped her head to the side, making an interrogative little noise in the back of her throat. Without Kakashi or Pakkun to translate, it was hard to speak with humans who didn’t know how to listen properly, but Yuuhi was smart. Kin gave an exaggerated yawn and let her tongue loll out, ears relaxed, tail sweeping lazily. Sleepy, not upset. She held it for a moment, then looked at Yuuhi intently. Kakashi had tried teaching the pack how to nod when he was younger, before Kin’s time. It was a deeply unnatural movement. Kin gave a soft, pleased yip instead, tail beating the ground twice. Offended, Kin sat back on her haunches. She was an excellent war-dog. Kakashi had used her for hunting, and tracking, and guarding, and—and— maybe she wasn’t blooded yet, but she would be, and the pack would be proud of her. Besides, what else was there? She was too young for puppies, too old to stay home. She liked the human world. Well, there was curling up around Tousaki, and her little knife girl, and the boy-pup, and their dam, until they stopped smelling like salt and stress and bleak, sad things. But that wasn’t a job. That was… an extra thing, between other jobs. She snorted at Yuuhi, loudly and rudely to cover her confusion, and flounced back to Tousaki, who was just starting to wake up with strangled complaints about pins and needles. He fell over entertainingly, which knocked Kakashi awake and broke Shiranui-lieutenant out of his trance. It took everyone a while to settle back down. Kin tucked herself defensively against Kakashi’s side, muzzle resting on crossed paws. She wrestled with complicated thoughts that made her skull hurt until she fell asleep again. They spent two more days on the train. The ninja mostly worked on writing reports, because they’d forgotten how to have fun, but Kin and the pups invented lots of interesting games before they all finally disembarked at Nagiso. From there, it was another day and a half through lush summer forests to Konoha. Kakashi remained on sake-cart duty, increasingly grumpy about it. Tousaki, Shiranui-lieutenant, and Namiashi-captain traded off on the family cart. Kin rode next to her little knife girl, stuck to Kakashi’s heels, or scouted with Tousaki, bouncing along next to his effortless long-legged run. In spare moments, she hunted forest mice, who were fast, difficult bastards to catch, and therefore prized hunting trophies. The last night was interesting. They were heading south in summer, so the air was hot and sticky and laced with bugs, but the proximity to home made the five shinobi almost buoyant with relief. Harubi, by contrast, was more tense with every kilometer rolling away beneath the cartwheels. Meanwhile, the boy-pup was excited by new lands, and the little knife girl was split between them, pleased for her littermate, anxious for her dam. It was too hot for Kin to be any kind of comfort. She stuck with Tousaki instead, loping ahead of the main group. They reached the stream first. It tumbled cheerfully down a shallow hill, collecting in a deep pool at its base, cold and clear as glass. Broad-leafed trees surrounded the clearing, casting dappled shade over the water. Tousaki glanced at her sidelong. Kin took a single step back, then flung herself forward. She leapt at the water’s edge, stretching into a glorious arch that carried her out to the middle of the pool, where she dropped. It was so cold, and so nice. And there were fish. Kin caught two more fish before the carts showed up, while Tousaki floated on his back and made happy sighing sounds. He was slightly undercut by the two youngsters flinging themselves into the water. Even Kin’s little knife girl whooped. Tousaki cheered and immediately splashed Kin and the pups, because he was a cheater and had hands. Shiranui-lieutenant smiled, ducked free of the cart, and graciously helped Harubi and Yuuhi down. It didn’t take long to get everyone in the water. Namiashi-captain and Shiranui-lieutenant both stripped off their shirts and pants, like Tousaki, but left their small-pants on. Yuuhi did the same, except she kept some sort of chest-wrap on, too. Harubi only removed her pants; her shirt, unwrapped, fell to her mid-thigh. After some hesitation, Kakashi removed his shirt and rolled his pants up to his knees, because Kin’s human was the strangest human, but she loved him anyway. He looked strange in his new, scarless skin, wading into the water as if he half-expected it to bite. Tousaki was having a water fight with the pups, and losing. Shiranui-lieutenant had ducked under the water, and come up sleek and gold, like a seal, or Kin’s unfortunately bald cousin. Namiashi-captain stared at him. So did Yuuhi, until Harubi said something that snared her attention. Kin paddled circles around all of them, barking happily as, one by one, they unwound enough to splash and play. Even Kakashi joined in eventually, first when Tousaki tried to dunk him, and again when the boy-pup scrambled up on his shoulders and declared he was a water-horse. Kakashi bore that for five minutes, until little hands yanked on his ears and Tousaki had to rescue them from each other. That evening, they ate the last tanuki rations and a small forest pig Kin brought down, roasted-black on the campfire with wild carrots. Kin’s little knife girl was allowed to butcher it, proving her name. She had steady hands. After food, Namiashi-captain, Shiranui-lieutenant, Yuuhi, and Tousaki told Fire Country stories — kind ones that settled Harubi’s nerves, and funny ones that entertained the pups. Kin lay over Harubi’s feet and gnawed on pig bones until they cracked and she could lick the rich marrow out. That night, she curled up near Harubi, close enough for reassurance, not close enough to overheat, and when Harubi woke up with tense hands and tears on her cheeks, Kin was there to lick her face. The last morning, before dawn, Kakashi took the handle of the family cart before Namiashi-captain could, and asked a question without words. 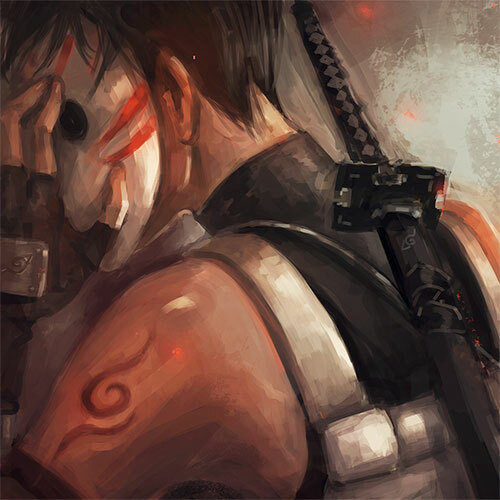 Namiashi-captain paused, and looked at Kakashi’s body, and his hands, where Kin could see reasoning like a trail. Slowly, Namiashi-captain nodded, and left them alone. For the last leg of the journey, Kakashi told different stories. A few from the war. One from the Fox. They weren’t kind, and they weren’t funny, but they ended the same way: Konoha survived. Konoha always survived. Her people banded together and saved each other. Tadaichi liked the action. Sen liked the justice. Harubi wrapped her arms around both pups, despite the heat, and listened intently. When Konoha’s walls finally edged over the horizon, she wasn’t settled, and she wasn’t calm, but she was resolved, and her little ones were steady. Kin trotted proudly at Kakashi’s side, and watched her home-not-home come into view with happy eyes. Oh this is gorgeous. Kin is the Best Dog. I love Kin. And your writing. And plot. Wonderful. I liked Kin’s perspective. The part at the end with Kakashi adding the stories they needed to hear, not just the ones they wanted was great.